Teen Titans was a beloved, fairly-serious, sometimes thematically challenging Cartoon Network program based on Glen Murakami’s comics. Teen Titans Go! was Cartoon Network’s sillier spinoff show. Think Muppet Babies versus The Muppets: smaller, cuter, sillier and basically inferior in every way. No, that’s too harsh. Teen Titans Go! to the Movies—the diminutive superheroes’ cinematic leap—is not without its share of charm. Directors Aaron Horvath and Peter Rida Michail (both from the TV series) bring the same zany, juvenile, self-aware sensibilities to the big screen that burst for years from the small one. Robin, Cyborg, Raven, Beast Boy and Starfire aren’t being taken seriously by the superhero community. What they need is their own superhero movie! Everybody else has one! That’s how you know you’re really a hero, and not just a sidekick with a bunch of costumed goofball buddies. What follows is a comment on the oversaturation of the superhero film punctuated by a lot of poop jokes. 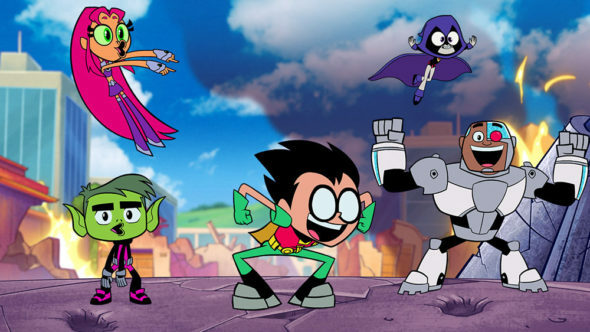 The voice talent from the TV show (Scott Menville, Hynden Walch, Khary Payton, Greg Cipes and Tara Strong) is joined by big names (Kristen Bell, Nicolas Cage, Will Arnett, Patton Oswalt, Jimmy Kimmell) in fun cameos. The best, most on-the-nose cameo belongs to Stan Lee, who sends up his own omnipresence as well as the Marvel/DC conflict and general nerdom with a spry little number. There are laughs—some of them tossed with a surprisingly flippant sense of the morbid—and energy galore, but it’s all a kind of sugar rush. It’s fun for about 22 minutes, but by minute 23, you’ll be checking your watch. By minute 50, you will be squirming restlessly in your seat. By minute 80 you may have that fidgety kid next to you in a headlock, but who’s to blame him for kicking and wriggling and causing a ruckus? He’s as bored as you are! By the 93-minute mark, you may be rushing for the door, and that’s too bad, in a way, because the bittersweet stinger you’ll miss with your hasty exit only brings home how slight and silly a spinoff Teen Titans Go! really is. We Can’t Quit You, Rom-Com! ← The Screening Room: Action Packed!